With Assured Shorthold and Assured Shorthold Tenancies (AST), the Landlord can apply for possession after the expiry of a Section 8 Notice. The Notice must be served upon the tenant and include a legal description of the breach they have committed – These are known as Grounds. Whilst there are 17 Grounds that may be used when seeking possession of a property for Landlords only 1,8,10,11,12,13,14,15,17 apply. Ground 1: The landlord requires possession in order that they may live in the property. MUST have previously been their residency. Ground 8: Rent arrears, Over Two Months or more than 8 weeks if the weekly payable rent is due. Ground 10: Rent arrears, Some money is lawfully due. Ground 11: Rent is persistently paid late. Ground 12: Breaches of the terms of the tenancy agreement. Ground 13: Disrepair to the property. Ground 15: Disrepair to the furniture. Non-rent arrears see Letters for Access & Breaches. or Issue a Section 8 Notice for non-rent arrears. Either notice should be served with a witness present. This is a formal notice that informs the tenant they MUST remedy the breach or you may take the matter further [apply to court]. What happens after I have made my application for a Possession Order? The Tenant has vacated Can I change the locks? The Tenant has left owing you Money - How do I recover this debt? The Tenant brings a counter claim - This is extremely complex. Provided the Judge is satisfied your application is valid the decides to grant a possession or issue a suspended possession order. You are typically informed at the Hearing and then by post. The Tenants are given a date to vacate or informed of the conditions of the suspended order. 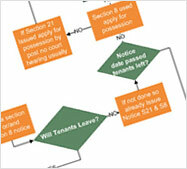 Should the Tenants fail to vacate by the date of the possession only then can you apply for a Bailiff. The Tenant can still appeal and the Possession Order can be set aside. What do I do if the Tenant leaves possessions in the premises? The Tenant has left Owing you Money .